Leicestershire seamer Andy Harris has announced his retirement from first-class cricket after 18 years in the game. Harris, 37, took 451 first-class wickets in a career which included an England A tour of Australia in 1996-97 and was Leicestershire's leading Championship wicket-taker last season. 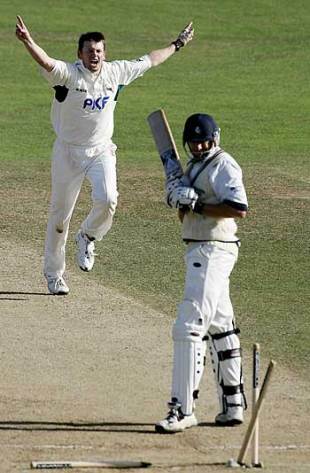 He began his career with Derbyshire in 1993 and moved to Nottinghamshire in 2000 for nine seasons, where his 49 wickets helped them to the Championship title in 2005. A hard working and popular seamer, Harris had the ignominy of being just the third player to be 'timed out' in first-class cricket, against Durham University, in 2003. Last season Harris became the last man to dismiss Michael Vaughan before the former England captain announced his retirement from the game. Though he started this season promisingly, taking seven wickets in Leicestershire's first two successful Championship games of the season -against Northants and Derbyshire - he then found his opportunities limited with Matthew Hoggard, Nathan Buck and Nadeem Malik all performing well. After almost two decades in the game, Harris has looked back on his career with fond memories. "It is with great sadness that I have decided to retire from first-class cricket at the end of the 2010 season with Leicestershire. "I have been fortunate enough to have played for 18 seasons during which time I have played with and against some very special players and some of the finest cricketers to have ever graced our beautiful game. I am honoured to be able to call many of them a friend and it will be strange not to be sharing a changing room with them again. "I always received the most incredibly generous support from players, staff, the media and especially the members and supporters of all the teams I have played for and I cannot thank them all enough. "But all good things must come to an end and now is the right time to move on and I look forward to my future with great enthusiasm. I hope people will feel that I always gave 100 per cent whenever I walked out for their team."